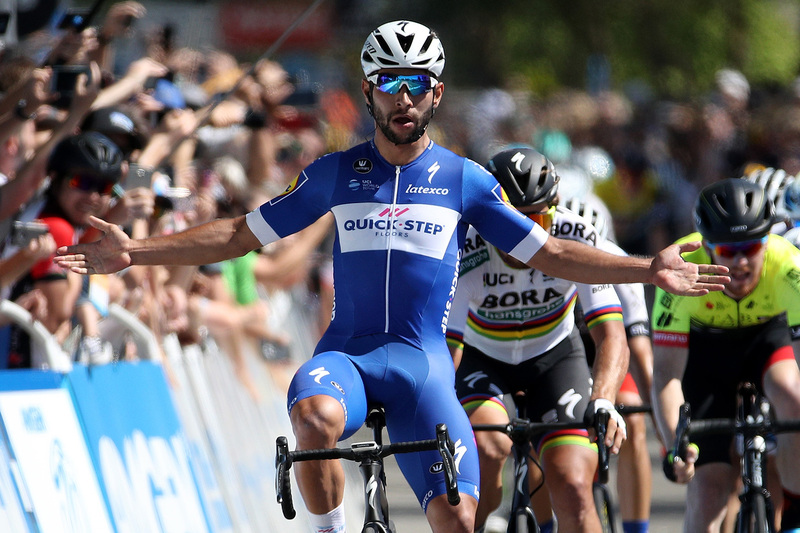 Quick-Step Floors' Fernando Gaviria claimed his second win at the 2018 Amgen Tour of California, his sixth of the season. Gaviria further cements his comeback from a hand injury earlier this year, with the stage podium result duplicating Sunday's Stage 1. "We are happy because [it was a] really nice victory today…these guys [teammates] are really strong, and I'm really happy," said 23-year-old Gaviria. A breakaway formed just after today's Stage 5 presented by Visit California took off in Stockton and lasted until the last few miles containing Stijn Vandenbergh (AG2R La Mondiale), Michael Rice (Hagens Berman Axeon Cycling Team), Tanner Putt (UnitedHealthcare Pro Cycling), and teammates Ruben Companioni and Fabian Lienhard (Holowesko|Citadel p/b Arapahoe Resources). 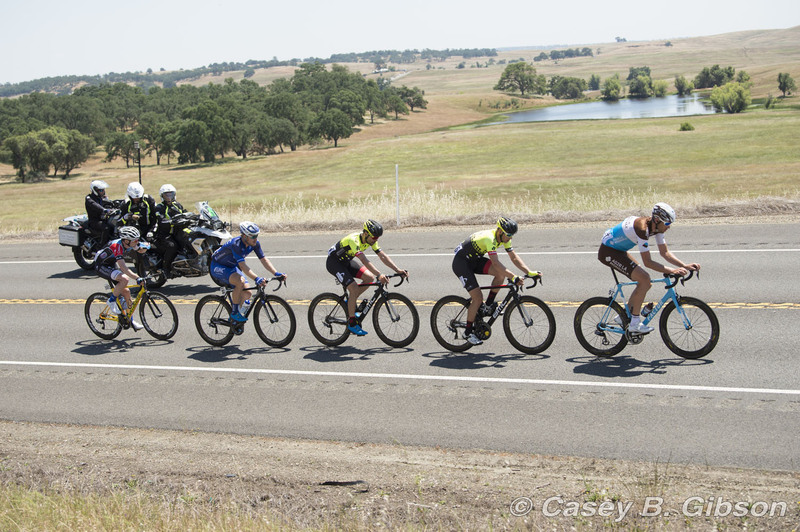 The final miles of the mostly fast and flat course to Elk Grove saw chaos on the road beginning with Team Dimension Data's decorated sprinter Mark Cavendish (GBR) suffering a wheel mechanical with under 10 miles left to ride. Despite losing time on the repair, he was able to work his way back up to the main group, narrowly escaping a crash in the final couple of miles that took several riders out of contention. Favoured sprinters for this stage suffered tire punctures in the final few miles: Team Katusha Alpecin's Marcel Kittel and Mitchelton-SCOTT's Caleb Ewan, who was able to rebound and propel himself in the final meters from fourth position to end the stage in second, just ahead of BORA-hansgrohe's World Champion Peter Sagan. Ewan's ride earned him a start tomorrow in the Visit California Sprint Jersey. Egan Bernal, Team Sky's 21-year-old Colombian rider. "It's gonna be a really aggressive race tomorrow. Bernal is gonna for sure do everything he can to try to wrestle this jersey off of me, and I'm gonna do everything I can to keep it on my back," said van Garderen, the 2013 Amgen Tour of California Champion. Bernal retains the Lexus King of the Mountain Jersey and the TAG Heuer Best Young Rider Jersey for the fourth day. For his part in the breakaway, Fabian Lienhard (Holowesko-Citadel p/b Arapahoe Resources) received the Breakaway from Cancer Most Courageous Rider Jersey. 70 Evan Huffman (USA) Rally Cycling all s.t. 73 Danny Pate (USA) Rally Cycling both s.t. 75 Roger Kluge (Ger) Mitchelton-Scott s.t. 78 Benoit Cosnefroy (Fra) AG2R La Mondiale s.t. 85 Daniel Oss (Ita) BORA-hansgrohe s.t. 89 Tanner Putt (USA) UnitedHealthcare Pro Cycling both s.t. 92 G. Lawson Craddock (USA) EF Education First-Drapac p/b Cannondale s.t. 95 Sepp Kuss (USA) LottoNL-Jumbo both s.t. 103 Tyler Magner (USA) Rally Cycling all s.t. 110 Jai Hindley (Aus) Team Sunweb all s.t. 115 Lachlan Morton (Aus) Dimension Data all s.t. 22 Peter Stetina (USA) Trek-Segafredo s.t. 31 Kasper Asgreen (Den) Quick-Step Floors s.t. 84 Taylor Phinney (USA) EF Education First-Drapac p/b Cannondale s.t.